Did you have lots of candy canes left over from Christmas? Are you tired of moving them around in your pantry? Here is a way to “re-purpose” your extra candy canes. 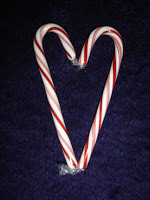 Use leftover candy canes to make hearts for Valentines’ Day. Use the hearts for creative name tags on gifts. Leave messages of love in crazy places for your loved ones to find. A heart center can be created out of a piece of pretty stationary/computer paper.